New York, 17th Mar 2016 – U.S. ad revenues swelled across all media sectors, except the print market, during the second month of the year, according to global advertising data company Standard Media Index (SMI). The total market rose by 10% in February compared to the same period last year. Healthy television ad revenues during the month contributed to solid results (5% YoY) for the sector despite flagging ratings evident across the board. Notably, this awards season appeared to lose its luster with weak performances from both the Grammy Awards and Oscars broadcasts. It was still a mixed bag for TV despite its overall growth. Broadcast’s revenues shed -2% for the month, however cable and all other TV sectors recorded year-on-year percentage growth in the single to double-digit range. “While February continued to see ratings under pressure it looks like most of the cable networks have been able to wash a lot of their audience make goods through their systems and are starting to book some pretty healthy year on year revenue gains. TV continues to prove it’s the most powerful medium for reaching large, easily targeted and engaged audiences,” said James Fennessy, SMI’s CEO. “Advertisers are also seeing that adding video to a TV buy multiples the effect and ROI of their campaigns and we’re seeing this in the very considerable and consistent growth levels delivered by video on both premium sites and through social platforms. We expect to see this trend accelerate through 2016 as measurement continues to improve.” There were 21% more advertising dollars invested in the thriving digital sector this February over 2015, which comes as advertisers continue to favor the medium as a more effective way to reach their audiences. Digital’s share of total ad spend has increased to 27%, rising by 3 points in February compared to 2015. In traditional media, radio advertising spending (22% YoY) in February eclipsed even digital media’s performance in a surprising result, while newspapers (-17%) and magazines’ (-5%) ad revenues delivered negative year-on-year results. SMI’s data showed that out of home (10%) advertising continues to be another bright spot in the market, maintaining the momentum it generated in late 2015. Interestingly, U.S. consumer spending sputtered in February, according to a report released by the Census Bureau, while advertising spending continues to grow. Retail sales have now fallen for two consecutive months, a sign that the ad market might soon experience a knock-on effect. 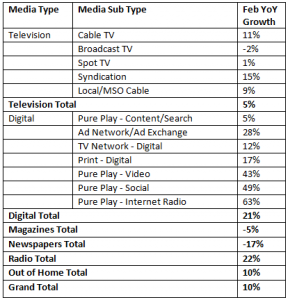 In February, Cable TV grew by 11% YoY and broadcast TV slipped by -2% year-on-year. Reporting on national advertising from global agencies, SMI’s data showed that Syndication, Local/MSO cable and Spot TV all had percentage growth in the single to low double-digits in the month. It was another relatively flat (3% YoY) month for upfront ad spending, driven by cable TV’s 8% growth and broadcast’s -2% decline. Maintaining its performance of recent months, the scatter market recorded an 11% YoY increase in February. With a 21% YoY uptick, cable TV was the key driver of growth however the broadcast TV scatter market was -2% YoY weaker in the month. The top six broadcast networks saw ad sales drop by -2% YoY in February 2016. CBS was a stand-out performer, thanks to a bumper month with its broadcast of Super Bowl 2016. The match attracted 111.9 million viewers and was the third most watched program in TV history. Cable networks HGTV, ESPN and TBS continued their strong performance with healthy double-digit percentage rises again in February. The much-hyped launch of TBS’s Full Frontal with Samantha Bee in early February garnered strong ratings for the network which translated into healthy revenue gains. Advertisers capitalizing on the dynamic digital media market drove ad spend volumes up, investing strongly in internet radio (63% YoY), social media sites (49% YoY) and video sites (43% YoY) in February. The top advertiser categories prospering from high spending in a year-on-year performance in February were prescription pharmaceuticals (49%), quick serve restaurants (30%) and food, produce and dairy (27%).